Keep ants and other crawling insects out of your hummingbird or oriole feeder using the Wildlife Accessories Trap-It Ant Trap. 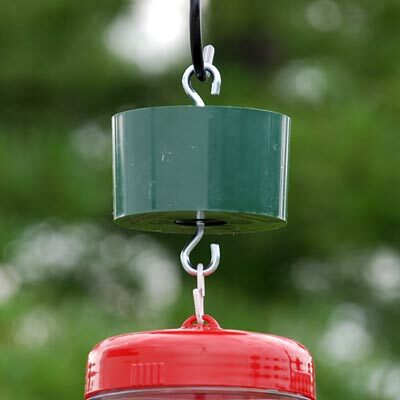 This unit hangs conveniently between your feeder and a hook, and the well holds 5 ounces of water. As ants climb down the hanger, they are unable to find a way around this natural deterrent. The green plastic adds a touch of color to the item, and easily blends with your garden. Prevent ants and other crawling insects from spoiling your nectar with this Trap-It Ant Trap. Made in the USA.